A cervical herniated disc can occur in virtually any of the spinal levels in the neck, but is most often seen at C5/C6, C6/C7 or C7/T1. These lower levels of the cervical spine endure the brunt of the spinal aging processes and are also common sites for cervical degenerative disc disease. 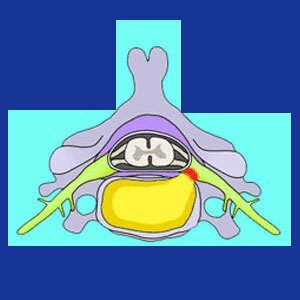 In fact, this universal disc deterioration is one of the factors which make herniations so prevalent here. Cervical herniations are usually not pathological in their milder forms, but can create significant problems for the patient when they impinge on a nerve root or compress the spinal cord itself. The scope of this article will detail some of the more important facts about cervical disc concerns, including the reasons why they exist and the symptoms they may produce. Spinal injury can traumatize the intervertebral discs, causing bulging, herniation, rupture or extrusion to varying degrees. Whiplash injuries, motor vehicle collisions, falls and sporting injuries are some of the most notable reasons for a traumatic herniation to take place. The spinal aging processes, such as disc desiccation, can facilitate herniations. Atypical spinal curvatures and vertebral misalignments can cause herniations to occur in particular circumstances. Bulges are the least significant of the various types of herniations. In these instances, the disc remains sound and intact, but suffers an asymmetric bubble in one or more locations. Bulges can be tiny, or rather large, and more severe bulges may be just as symptomatic, or more, as the worst variations of disc pathologies detailed below. Herniation is a general term which usually means that the disc has remained in one piece, but demonstrates a separated pocket of nucleus material pressing against the outer wall. Alternate terminologies may include disc protrusion, disc prolapse or slipped disc. A ruptured disc occurs when the annulus fibrosus is compromised and the nucleus has a chance to bleed out of the disc structure. A simple hole in the outer wall is called an annular tear. If the disc ruptures with force enough to eject some, or all, of the nucleus, this is called a cervical extruded disc. If the extruded portion of the nucleus separates and migrates, this is called a cervical sequestered fragment. In cases where many small pieces of nucleus migrate in different directions, this may be called a cervical fragmented disc. The above variety of disc pathologies is not intended to be arranged in order of symptomatic severity. In fact, some of the most destroyed discs are actually not symptom-generating at all. Meanwhile, an intact disc bulge may produce frightening expressions of pain and neurological dysfunction. It is crucial to understand this basic fact. The most important factor in whether or not a herniation of any type will produce symptoms is the question of nerve tissue involvement. If a herniation influences a nerve, be it a spinal nerve root or the spinal cord, then symptoms may be enacted. If no nerves are affected, then symptoms are unlikely, regardless of the severity of the bulge or rupture profile. Remember, discs have no internal nerve endings and will never feel pain themselves, even if utterly destroyed. However, if a nearby nerve is affected through structural compression or chemical irritation, then symptoms are likely to some degree.